After making start.me faster than ever, we’ve been working really hard to make it more useful to everyone. That’s why we’ve made your bookmark widget creation even simpler. We’ve also made it easier to copy individual bookmarks. And finally, we’ve got some great announcements for mobile users. Read on to discover everything we’ve been working on this week. 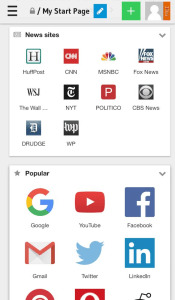 Creating a new bookmarks widget has never been this easy. The most essential building block of your personal startpage at start.me is the Bookmarks Block. This is where we really stand out from the crowd. Within these blocks, you can choose icons, change names, add color, arrange and rearrange. Nowhere online will you find as many options to personalize bookmarks, visualize and organize them. With a simple drag and drop, no less. But what if you want to pry one bookmark off from a collection you’ve already made? Do you first have to create an empty Bookmarks Block? But how, and where exactly? Where will this new block end up? As of today, the answer is simple: you left-click the bookmark you want to drag and drop it to its new destination. A brand-new Bookmark widget will magically appear. Right-click to open the context menu and copy along! Some of our users asked us to add a ‘Copy’ link feature to the context menu, so that’s what we did. Anything to make life easier. Right-click on any bookmark, and you paste it into your favorite program with a simple Crtl-V (Windows) or ⌘-V (Mac). This function will be especially useful when sharing links by e-mail or in a Word document. Don’t like the Context menus at all? You can switch it off in the user preferences. Click on the Account icon (top right corner), and choose Preferences. You’ll find the ‘Show start.me context menu‘ just above the Done button. The final improvement we’d like to mention is our new and fully responsive mobile experience. It has always been possible to use start.me on your mobile device, but honestly, this hasn’t been our most beautiful feature. It involved a bit too much horizontal scrolling, in our opinion. That’s over now. Whenever you open our website, you just scroll down and click away. All widgets render on the same page, fast and reliable. This improvement is a precursor of the entirely new mobile experience we hope to launch next month. We aim to optimize start.me for any mobile device, empowering you to navigate the internet more efficiently and wherever you are. For many years Stefan has been active as a blogger, building and maintaining his own and other websites. He is also the author of two well-received novels. Wherever possible, he tries to combine modern technology with literary or at least pleasantly legible content.